Luckyday Scholars attend study hall to help them develop good study habits and help with the adjustment to college life. Study halls are held in the J.D. Williams Library on the second and third floors, and in the LRC Study Library/Computer Lab. Sunday, 6 p.m. to 10:00 p.m.
Monday-Thursday, 10 a.m. to 10 p.m. Specific floor hours will be given at the beginning of each semester. Luckyday Scholars are required to sign in/sign out with the proctors. Failure to do so will result in zero hours logged. 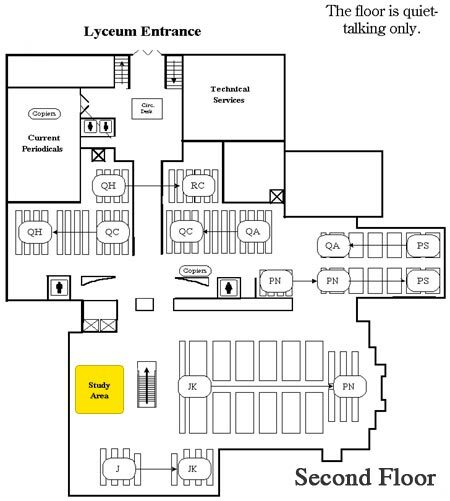 Proctors will be stationed in the highlighted areas on the maps (see below). 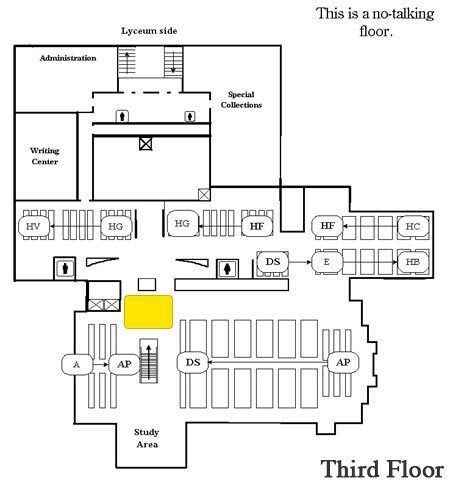 The yellow block area represents the designated area for study hall. Luckyday Scholars are required to remain in sight of the proctors during hours spent in the J.D. Williams Library and LRC Lab. Study hall hours are to be completed each week. Students are responsible for keeping track of their hours.